Antiques and vintage finds lend a classic look to this lovingly restored Sussex home (page 68). s u b s C r i b e Subscribe to 25 Beautiful Homes today for £30.99, saving 40% on the full price (see page 58). Go to magazinesdirect.com/27AC or call 0330 333 1113 and quote code 27AC. editorial Complaints We work hard to achieve the highest standards of editorial content, and we are committed to complying with the Editors’ Code of Practice (ipso.co.uk/IPSO/cop.html) as enforced by IPSO. If you have a complaint about our editorial content, you can email us at complaints@ti-media.com or write to Complaints Manager, TI Media Limited Legal Department, 161 Marsh Wall, London E14 9AP. Please provide details of the material you are complaining about and explain your complaint by reference to the Editors’ Code. We will endeavour to acknowledge your complaint within five working days and we aim to correct substantial errors as soon as possible. 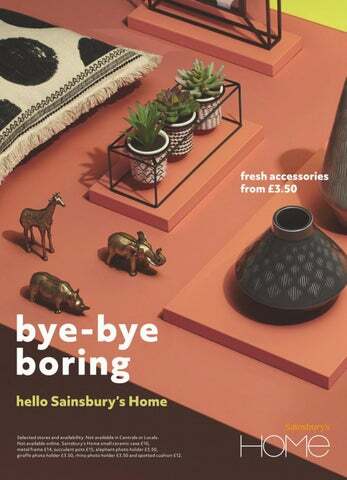 All prices quoted in this issue including VAT at the current rate were correct at the time of going to press, although you are advised to check cost and availability before buying. 25 Beautiful Homes is published by TI Media Limited, 161 Marsh Wall, London E14 9AP. Repro by Rhapsody, 109/123 Clifton Street, London EC2A 4LD. Printed by Walstead UK Limited. Cover printed by Walstead UK Limited. Publisher’s subscriptions rates for 12 issues (including p&p): UK, £52.20; Europe & Eire, €170.20; USA & Canada, $111.30; rest of the world, £129.90. For all subscription enquiries and UK orders, call 0330 333 1113 or email help@magazinesdirect.com. For overseas orders, please call +44 (0) 330 333 1113. T H E P R O P E R T Y Oast house, converted in the Forties L O C AT I O N Kent R O O M S Sitting room, kitchen-diner, snug, study, utility room/cloakroom, four bedrooms (one en suite), two bathrooms P U R C H A S E D 2014 PREVIOUS PROPERTY ‘Before this, we lived in a Victorian terraced house in the centre of Tunbridge Wells,’ says Sam. THE PROPERTY Sixties bungalow L O C AT I O N Cheshire R O O M S Hall, sitting room, kitchen-diner, study, two bedrooms (one en suite), bathroom P U R C H A S E D 2016 PREVIOUS PROPERTY ‘We moved to this house from a Thirties end-of-terrace in Warrington,’ says Debbie. The properTy Victorian house, built in 1850 L o c aT i o n Lincoln r o o m s Hall, sitting room, kitchen-diner, snug, TV room, cloakroom, three bedrooms (one en suite), two bathrooms p u r c h a s e d 2008 previous properTy ‘We moved to this house from a detached property in rural Lincolnshire,’ says Gilly. THE PROPERTY Semi-detached Victorian cottage L O C AT I O N Yorkshire R O O M S Hall, sitting room, kitchen-diner, study/sitting room, two bedrooms (one en suite), bathroom P U R C H A S E D 2012 PREVIOUS PROPERTY ‘Before, we rented the converted Mechanics’ Institute in the village,’ says Maggie. home truths THE PROPERTY Traditional clapboard farmhouse, built in 1813 L O C AT I O N Maine, US R O O M S Sea room, dining room, kitchen/sitting room, snug, study, cloakroom, three bedrooms, two bathrooms P U R C H A S E D 2010 PREVIOUS PROPERTY ‘We also have a home in Portland, Maine,’ says Drew. the PROPeRtY Maisonette in a Sixties block L O C At I O N West London R O O M S Hall, sitting room, kitchen-diner, cloakroom, three bedrooms (one en suite), three shower rooms P U R C h A S e D 2009 PRevIOUS PROPeRtY ‘We also have a 17th-century farmhouse in the Norfolk countryside,’ says Emma. Don’t live in a pin. The Internet, it’s a wonderful source of inspiration, but it’s just that; inspiration. Only you can make your home your own, and a space you love. You won’t find it on the Internet, you’ll find it in your head. Bring it to life with Craig & Rose premium paints. home truths THE PROPERTY Edwardian terraced cottage L O C AT I O N North Yorkshire R O O M S Hall, sitting room, kitchen, study, garden room, three bedrooms, bathroom P U R C H A S E D 2014 PREVIOUS PROPERTY ‘We lived in a much smaller terraced house,’ says Laura. as possible, though – handmade kilims, wool throws for the sitting room and bedrooms, and oak flooring and worktops, for example.’ Fresh foliage and botanical prints play their part, too. Plenty of leafy houseplants add an invigorating dash of green to all the greys, in keeping with Laura’s early promise to create a seamless link between their home and garden. Transformation complete, Will and Laura are delighted with the results of all their hard work. ‘There is nothing that we wouldn’t do all over again,’ says Laura. t h e P r o P e r t y Grade II-listed detached Victorian house L o c at i o n Leeds r o o m s Sitting room, family room, dining room, kitchen, cloakroom, office, four bedrooms (one en suite), dressing room, two bathrooms P u r c h a s e d 2017 Previous ProPerty â&#x20AC;&#x2DC;Joe had a city-centre apartment and I owned a converted chapel of rest outside Leeds,â&#x20AC;&#x2122; says Jo. *Buy now pay in 12 months finance offer is available on orders over £2,000 +VAT. Finance is subject to status, terms apply. Renovating your staircase into an exquisite feature is much easier and less costly than you’d imagine. In just 1-2 days and with no building work, we will transform the heart of your home, and add value to your property with a stunning, handcrafted staircase. All in a style to suit you and your budget. I WOULD LIKE TO SEND A GIFT SUBSCRIPTION TO Please fill out both the recipient’s details below and your details above. To give more than one subscription, please give address details on a separate sheet. Monthly extras, exclusive to subscribers. Instructions to your Bank or Building Society: Please pay Magazines Direct from the accounts detailed on this Instruction subject to the safeguards assured by the Direct Debit Guarantee. I understand that this instruction may remain with Magazines Direct and if so, details will be passed electronically to my Bank or Building Society.  Please keep me up to date with special offers and news just by email from carefully selected companies. Your personal details will not be shared with those companies - we send the emails and you can unsubscribe at any time. Offer closes 31st May 2019. Offer open to new subscribers only. Direct Debit offer is available to UK subscribers only. £30.99 payable by annual Direct Debit. This price is guaranteed for the first 12 months and we will notify you in advance of any price changes. Please allow up to six weeks for delivery of your first subscription issue (up to eight weeks overseas). The full subscription rate is for 12 months (12 issues) and includes postage and packaging. If the magazine ordered changes frequency per annum, we will honour the number of issues paid for, not the term of the subscription. For full terms and conditions, visit www.magazinesdirect.com/terms. †The Rewards scheme is available for all active print subscribers of magazines published by TI Media Limited, free of charge. Full terms and conditions are available at mymagazinerewards.co.uk. Digital subscribers also get access as long as the subscription has been purchased directly through the publishers at magazinesdirect.com. For enquiries please call: +44 (0) 330 333 1113. Lines are open Monday-Saturday 8am-6pm UK time or email: help@magazinesdirect.com. Calls to 0330 numbers will be charged at no more than a national landline call, and may be included in your phone provider’s call bundle. THE DIRECT DEBIT GUARANTEE. This Guarantee is offered by all banks and building societies that accept instructions to pay Direct Debits. If there are any changes to the amount, date or frequency of your Direct Debit, Magazines Direct will notify you 10 working days in advance of your account being debited or as otherwise agreed. If you request Magazines Direct to collect a payment, confirmation of the amount and date will be given to you at the time of the request. If an error is made in the payment of your Direct Debit by Magazines Direct or your bank or building society, you are entitled to a full and immediate refund of the amount paid from your bank or building society. If you receive a refund you are not entitled to, you must pay it back when Magazines Direct asks you to. You can cancel a Direct Debit at any time by simply contacting your bank or building society. Written confirmation may be required. Please also notify us. home truths t H E P r o P E r t Y terraced house, built around 1880 L o c At i o N London r o o M s hall, sitting room, kitchen-diner, tV room, snug, utility room, cloakroom, four bedrooms (two en suite), three bathrooms P U r c H A s E D 2008 PrEVioUs ProPErtY ‘we lived in an apartment in New york before moving back to england,’ says Jane. THE PROPERTY Victorian cottage L O C AT I O N Norfolk R O O M S Hall, sitting room, kitchen-diner, snug, playroom, four bedrooms (one en suite), shower room, bathroom P U R C H A S E D 2017 PREVIOUS PROPERTY ‘We moved here from a modern detached property in a nearby village,’ says Sophie. THE PROPERTY Detached Victorian house L O C AT I O N East Sussex R O O M S Hall, sitting room, kitchen-diner, dining room, office, utility room, larder, five bedrooms (two en suite), two bathrooms P U R C H A S E D 2013 PREVIOUS PROPERTY ‘Before moving here, we lived in a brick-and-flint home on the Sussex South Downs,’ says Paula. THE PROPERTY Victorian terrace L O C AT I O N Southwest London R O O M S Hall, sitting room, kitchen-diner, utility room, cloakroom, lobby, study, three bedrooms, two bathrooms P U R C H A S E D 2015 PREVIOUS PROPERTY ‘Before moving here, I had a flat in South Kensington,’ says Lynne. scale of most of the works was too large for her new home. ‘This wasn’t too disappointing as I realised that I’d prefer to have fewer really beautiful things than lots of bits,’ she says. ‘I admire the designer Rose Uniacke’s pared-back style and have bought one or two items from her, including the exquisite blue linen fabric slip-covering on a number of chairs.’ There are two very special pieces that Lynne always takes with her: a simple country antique table in the kitchen, which was a gift from her father, and a bronze ballerina statue by Helge Leiberg. ‘I bought it from a dealer friend, who was a former neighbour,’ she says, ‘and it has strong links to a happy past.’ On that spring day when Lynne found a house so ideal for her needs, it seems the lightest of touches was all it took to set the scene for a happy future. home truths THE PROPERTY Edwardian mid-terrace L O C AT I O N Southeast London R O O M S Hall, two sitting rooms, kitchen-diner, cloakroom, three bedrooms, bathroom P U R C H A S E D 2016 PREVIOUS PROPERTY ‘We moved here from a Victorian maisonette nearby,’ says Alex. The vintage plaited linen chairs bring a mid-century feel to the pastel scheme, with a dark pendant providing contrast. Plaster pink walls, matt black fittings and graphic tiles add a contemporary note to this room. Architecture matt white tiles, £59.40sq m, Fired earth. The properTy Converted Victorian warehouse L o c aT i o n North London r o o m s Hall, sitting room, kitchen, two bedrooms, two bathrooms p u r c h a s e d 2008 previous properTy ‘Before moving here, we lived in a Georgian townhouse in Hackney,’ says Romilly. Interior and garden design courses taught with industry partners. KLC’s high level of contact hours and careers support give the best value for money. Study at Design Centre, Chelsea Harbour or Online from home. THE PROPERTY Mid-terrace house, circa 1900 l O C AT I O N East London R O O M s Hall, sitting room, kitchen-diner, garden room, cloakroom, conservatory, five bedrooms (one en suite), three bathrooms P U R C H A s E d 2015 PREVIOUs PROPERTY ‘We were living in a smaller house, not far away from here,’ says Julia. urn your conservatory into a tropical paradise with this impressive and showy plant. Commonly called the Bird of Paradise Plant for its exotic flower heads that resemble a brightly coloured bird, the tall blooms rise on vertical stems up to 1.8m (6ft) tall and last an incredibly long time! The large, grey-green leaves are reminiscent of banana leaves, forming a handsome plant even when not in flower. A majestic and unmistakable feature plant for the conservatory which can be enjoyed on the patio during the summer months. Height: 180cm (71in). Spread: 100cm (39in). Offer available to readers on the UK mainland only. Offer subject to availability. Your contract for supply of goods is with Thompson & Morgan, a company wholly independent of 25 Beautiful Homes, published by TI Media Ltd. Cardholders call direct on 0844 573 1686 quoting TM_25BH6. The order lines are open seven days a week, 9am to 8pm (weekdays) & 9am-6pm (weekends) (voicemail at other times). Alternatively, please complete the coupon in BLOCK CAPITALS. Remittance may be made by MasterCard, Visa, Maestro, postal order or cheque (name, address and TM_25BH6 on the back of cheque, please), crossed and made payable to T&M. Offer available to readers on the UK mainland only. **Calls cost 7p per minute plus your telephone provider’s access charge. Please note that we cannot deliver this product to the following postcode areas: GY, HS, IV41-IV56, KW15-KW17, PA34, PA41-48, PA60-PA78, PA80, PH40-PH44, TR21-TR24, ZE1-ZE3. *Savings are based on the equivalent of multiples of the cheapest pack size. Pots shown for illustration purposes only. Closing date: 29 April 2019. Despatched from April 2019 onwards. All orders will be acknowledged by letter or email advising you of the expected dispatch date. home truths T h E P R o P E R T y Grade II-listed terraced retail conversion L o C AT I o N Suffolk R o o M S Hall, sitting room, kitchen/diner, snug, utility room, cloakroom, games room, study, five bedrooms (one en suite), dressing room, family bathroom, shower room P U R C h A S E D 2016 PREVIoUS PRoPERTy ‘We were living in a rented villa in Dubai,’ says Katherine. t h e p r o p e r t y Victorian terraced house L o c at i o n South london r o o m S Hall, sitting room, dining room, kitchen, cloakroom, three bedrooms, two bathrooms p u r c h a S e D 2016 previouS property ‘we moved from a two-bedroom maisonette in a four-storey Victorian townhouse,’ says lily. The one-stop edit of the best modern style and design ideas. ssential in understanding SYRETT’S vision for Runway Gallery is his background working in the fashion industry. ‘There’s been a big discussion in the art world as to whether fashion should be within the arts,’ says SYRETT. ‘It seems ridiculous, because it should be.’ So for SYRETT, a fashionfocused gallery was ‘a natural thing to do’. a dedicated exhibition in Leeds this autumn, too. ‘I’ve been invited by Black Box, who have teamed up with Land Securities and the Trinity Centre in Leeds, to exhibit my work and I’ve extended this to the Runway Gallery artists,’ says SYRETT. ‘I’m thinking of calling it Salon Noir, after the cave in the south of France, which has Palaeolithic drawings. The Runway artists are all doing new work and creating “museum” pieces, as I’m calling them, so they’re not necessarily things to go into people’s homes. Then hopefully we’ll be bringing that back to London.’ Buy contemporary and affordable art from SYRETT and all the artists mentioned above and more at runway-gallery.com. CoMing neXt Month Her passions include art and dance; her experience is creating make-up styles for some of the world’s top designers, such as Vivienne Westwood and Kansai Yamamoto. Bethany Perry’s work is bold and energetic, and displays an eye for the physical form. home truths THE PROPERTY Chalet bungalow L O C AT I O N Berkshire R O O M S Hall, sitting room, kitchen-diner, snug, playroom, utility room, three bedrooms (one en suite), dressing room, bathroom, garden office P U R C H A S E D 2015 PREVIOUS PROPERTY ‘Before moving here, we lived in a two-bedroom terraced house in west London,’ says Angela. home truths THE PROPERTY Victorian townhouse L O C AT I O N West London R O O M S Hall, sitting room, family room, dining room, kitchen-diner, one cloakroom, five bedrooms (three en suite), two dressing rooms P U R C H A S E D 2017 PREVIOUS PROPERTY ‘We moved here from a large detached family home in north London,’ says Sara. axappphealthcare.co.uk/beautifulhomes Our award winning Personal Health plan is tailored specifically for you and your family. Providing private healthcare cover for new medical conditions that arise after you join. THE PROPERTY Victorian terrace L O C AT I O N Southwest London R O O M S Hall, sitting room, kitchen-diner, basement study/ utility room/playroom, two cloakrooms, five bedrooms (two en suite), two bathrooms P U R C H A S E D 2016 PREVIOUS PROPERTY ‘We moved here from a smaller terrace nearby,’ says Sophie. the ProPerty edwardian semi L o c at i o n South london r o o m s Hall, sitting room, kitchen-diner, utility room, cloakroom, five bedrooms (one en suite), bathroom P u r c h a s e d 2009 Previous ProPerty ‘We lived in a Victorian terrace around the corner,’ says Sarah. home truths THe pROpeRTY Mid-terrace Victorian house L O c aT I O N Southwest London R O O M S Sitting room/ kitchen-diner, family room, three bedrooms (one en suite) bathroom p U R c H a S e D 2011 pReVIOUS pROpeRTY ‘We were living in an apartment in the same area,’ says Froso. home truths THE PROPERTY Villa, built in 1895 L O C AT i O n Cheltenham R O O M s Hall, sitting room, kitchen-diner/family room, snug, utility room, four bedrooms, bathroom, shower room P U R C H A s E D 1998 PREViOUs PROPERTY ‘i was living in a smaller property nearby and moved here when we got married,’ says Dee. BUY 2 – SAVE £10.00! ive your front door, conservatory, patio or balcony a sunny uplifting Mediterranean feel with these breathtaking 3ft tall winter hardy Oleander. Easy to grow, Oleanders thrive on neglect, surviving hot, dry weather or temperatures as low as -5ºC ...no wonder it’s one of the UK’s favourite hardy exotics! We have a limited number of these mature, well-established plants available. Supplied at 3ft tall in 5 litre pots, they can be seen at over £40 each in garden centres. Take advantage of this limited time offer and you can buy one for just £19.99. Or, save an extra £10 and buy two for only £29.98 – that’s just £14.99 each! BUY 2 FOR JUST £29.98 – SAVE £10.00! Smothered in beautiful hot-pink blooms all summer long! Beautiful hot pink ﬂowers all summer long Incredible instant impact for any garden! SEE THE VIDEO One of the UK’s favourite hardy exotics ONLINE Perfect for patio pots, or framing a door or gateway Important: Contact with Oleander foliage and its sap Lush, evergreen foliage for may irritate the skin. All parts of the Oleander Plant are toxic year-round interest if ingested. 0844 6 569 569 Calls cost 5p per min plus your network’s access charge. NEW! Blooming Fast Soluble Fertiliser – 500g The only fertiliser you need for more ﬂowers, more fruit, and better roots and shoots! Use on all your plants for quick, longlasting results! Orders dispatched within 7 days. Delivery to UK only and a £6.00 surcharge may apply to the following postcode areas: AB, BT, DD8-11, GY, HS, IM, IV, JE, KA27-28, KW, PA20-80, PH19-50, TR21-25 & ZE. Offer subject to availability and in the event that this offer is oversubscribed, we reserve the right to send suitable substitutes. Images show mature plants in situ. See website for full product details and T&Cs. © YouGarden Limited 2018. Yes, I would like to sign-up to the FREE YouGarden Newsletter. Please tick here if you would prefer not to receive offers other than from us. © YouGarden Limited 2019. An advertisement feature bringing you the best value for those special purchases around your home. AUTHENTIC BRITISH SOFAS HANDMADE TO ORDER Authentic Furniture is all about o�fering the very best customer service and a stunning range of handmade sofas that are, as per the very deﬁnition of Authentic; reliable, honest and trustworthy. Authentic is about designing and making British heritage sofas using traditional techniques and the skills of time-served cra�tsmen alongside a buying experience that is second to none. Underpinned by a deep knowledge of our furniture, every Authentic sofa is hand cra�ted to order with many bespoke options available, enabling us to create your perfect sofa. For more information and to order your FREE samples visit: www.authenticfurniture.co.uk or call us on 01629 704 704. COST-EFFECTIVE ELECTRIC HEATING Quantum Heating’s Dimplex off-peak heating system uses low-cost, off-peak energy with running costs up to 47% less than electric convector or radiator systems on an on-peak tariff and 27% less than standard storage heater systems. With an easy-to-use control system and a simple design that won’t detract from your furniture, these economical to run, maintenance-free heaters are perfect for keeping toasty throughout the year. ‘KID-TOUGH’ BEDS WITH A SPRINKLE OF MAGIC Our children’s furniture is perfect for bedjumping, fort-building, secret-squirrelling kids who need more than just a bed. At �e Children’s Furniture Company we mix clever storage solutions, awesome designs and triple paint protection to create handcra�ted kid-tough furniture that is built to last. Take a look at our clever furniture. Tel. 0800 009 6261 Web. www.TCFC.co.uk Save 15% o�f your order with code JUSTFORYOU15 before 30th June 2019. Pictured: Neutron bunk bed with stair storage. EXCLUSIVE STYLISH SEATING SAVINGS UP TO £200 OFF! This California lounge set is perfect for relaxing outdoors. It feels like natural rattan and can be left out all year round - maintenance free (cushions should be brought inside). Seating for at least ﬁve people with two comfy armchairs, a roomy three-seater sofa. This set also includes a matching coffee table. Also available in Taupe. Contact us for a free brochure. Tel. 0333 014 7771 Web. quantum-heating.co.uk Finance available subject to status. Get £150 cashback when you quote JFY19 on purchase of two or more Quantum heaters before 2nd May 2019. Heaters to be installed before 1st July 2019. T&Cs apply. OLD TIMBER WINDOWS DRAUGHTY,COLD,ROTTEN, STUCK SHUT OR OPEN? Then Ventrolla can help! They are a UK-wide sash window and casement window renovation company with local teams on hand ready to help renovate your tired, old timber windows. With services including draught prooﬁng, renovation, slim double glazing and bespoke new timber windows, they are sure to have the solution to suit you and your home. Enjoy al fresco living this summer with a Haus awning from Appeal. �e Haus awning combines the very latest design and technology with precision German engineering. Innovative features include automatic weather sensors that extend the awning to give shade when the sun’s out. An awning will provide welcome shade from the hot Summer sun and protect furnishings. Dimmable LED lighting and radio controlled infrared heating will allow you to spend more time relaxing and entertaining into the evening. To obtain your free brochure and details of the 10% o�f Special O�fer, simply go to www.appealshading.com/justforyouo�fer or call 0800 975 5757 making sure that you quote ‘Just For You O�fer’. O�fer ends 31st May 2019. To arrange a free survey and quotation, visit www.ventrolla.co.uk, or call 0808 301 9657. OFFER: Receive a 5% discount plus free hardware (worth over £30) for every window when you quote JUST19. All companies listed are wholly independent. We recommend that you carry out your own checks before entering into any agreement. When making any purchases we would recommend that you use a credit card providing protection in the unlikely event of any issues. No part of this page maybe reproduced without the permission of Canopy Media. Only £299. Only from us. Beautiful vanity units, tailored to your bathroom. Hand-built to permanent building standards for year-round enjoyment, our garden rooms are designed to extend your home and enhance your lifestyle. Installed with the minimum of upheaval, planning permission is normally not required. So if your family is growing and you need more space, or a garden office, gym or guest house, the Crown collection offers the perfect solution. Starting this spring, make more of your outdoor space with a beautiful, fully-insulated garden room. *Only available with a 20% deposit and the Buy Now Pay Later finance option. Subject to application and status. Nationwide Home Innovations is authorised and regulated by the Financial Conduct Authority. Eden Verandas is a trading style of Eden Verandas Ltd. Our registered address is Unit 13 Armstrong Mall, Southwood Business Park, Farnborough, GU14 0NR. Reg. No. 08259394. We are authorised and regulated by the Financial Conduct Authority FRN 801638. We are a credit broker and not a lender and offer credit facilities from a panel of lenders. *Representative example: Cash price £8000 deposit £2000, total amount of credit £6000. Payment within 12 months 0% interest. If not settled in the deferred period, 59 monthly payments thereafter of £158.77 and one payment of £158.10. Total amount payable £11525.53. APR 14.9%. **Terms & conditions apply. bold interior together. The same debonair look runs through the rest of the hotel, a sprawling property spread out across three Spanish colonial revival buildings. Such architecture called out for a design-led venture, and Hotel Californian’s luxurious lodgings don’t disappoint. Guests are welcomed through the original Twenties façade, and from there, the options for play are manifold. Blackbird, the riotously designed in-house restaurant, is worth visiting for its decadent decor alone. The Granada guest rooms come with spacious lounge areas and balconies that gaze out over the city’s charming red-topped roofs. After a day of exploring the pretty city streets, head down to the Marrakech-inspired Spa Majorelle to de-stress in the steam room or up to the very soigné rooftop pool. BESPOKE BRITISH FURNITURE DESIGNED, CR AFTED, GUAR ANTEED When you choose Neville Johnson you are investing in high quality bespoke furniture, attention to detail and superb customer service. For over 30 years we have been using the finest materials and craftsmanship to create exquisite fitted furniture with longevity and style. *Buy now pay in 12 months finance offer is available on orders over Â£3,000 +VAT. Finance is subject to status, terms apply.